WiSoccero is designed to take advantage of the exciting art of robotics by removing all the struggles involved and also adding a little more fun. It makes entering the world of Robotics as easy as possible. It begins by just playing with friends and travels to incredible areas like learning about robots and even developing amazing robotic projects. WiSoccero is agile and versatile. Unlike traditional RC Cars, it can move in any direction without any hesitation. 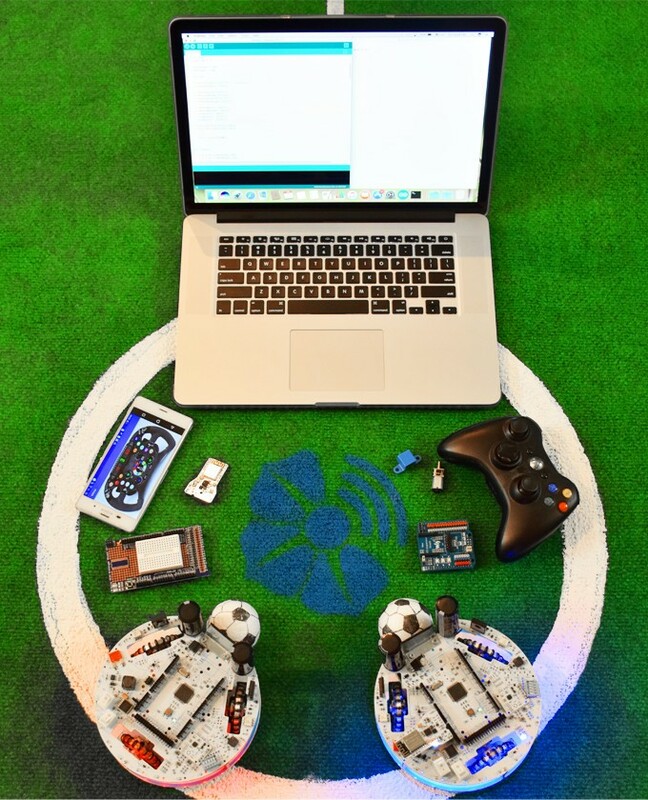 It employs a special wheel arrangement and omnidirectional wheels which gives it more freedom in maneuvering.In order to take advantage of this flexibility, the pack includes a customized DIY joystick kit that gives complete control of all its various features and capabilities over WiFi. 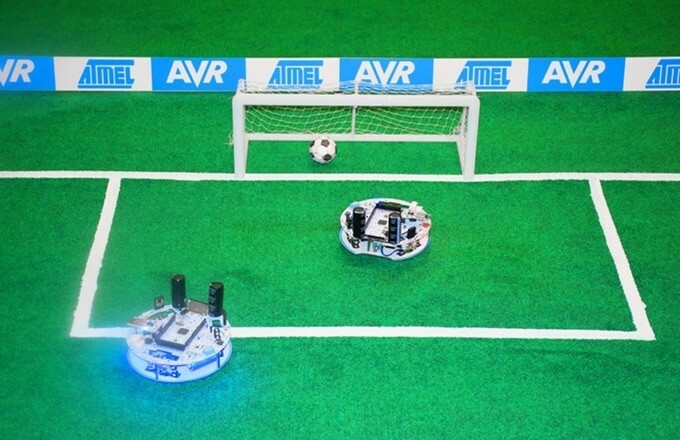 This soccer player robot is capable of kicking and passing the ball. It utilizes an electromechanical part (solenoid) and the necessary electrical drivers. This system is capable of kicking the ball with different level of force that can be controlled effortlessly. WiSoccero needs to be powered by 3 Li-ion 18650 cylindrical rechargeable batteries (at least 2200 mAh in capacity) that under normal condition lasts for about 2 hours. WiSoccero is based on ATmega2560 core and it has all standard Arduino Mega Headers. Also it’s equipped with WiLoader for WiFi programming and communication. It also comes with a lot of great components for hobbyist and developers like three DC motor drivers, Gyroscope (for orientation setting), DIP switch, buzzer, two LED Strings, two configurable buttons, power and protection circuit, two rocker switches for turning circuit and motors on/off separately, isolated voltage booster circuit and power transistors for kicker mechanism. WiSoccero is truly developer friendly. Thanks to its Arduino compatible headers and component placement, its possible to use any Arduino Mega shield such as distance sensor shield for obstacle avoidance, camera shields for autonomous operations and much more. Also you can use all these amazing shields while playing soccer. It’s truly fun! WiSoccero Kickstarter campaign starts on February 8 for a period of 30 days by PetuniaTech. It offers special discount for the first day only. The final products will be available on June 2017. Click here to view more on WiSoccero Kickstarter campaign. 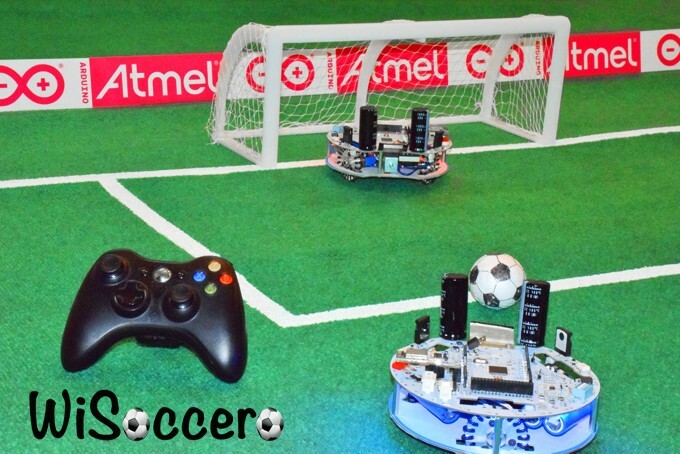 Dieser Eintrag wurde veröffentlicht in Crowdfunding, English, General und verschlagwortet mit Arduino, Robot, Soccer, Wifi Programming, WiLoader, WiSoccero von Sebastian Trella. Permanenter Link zum Eintrag.